Roses are very popular flowering shrubs that can be grown in many different garden situations. Modern varieties flower continuously from spring to fall and provide color in the garden all season long. With a little care in planting they will live for many years and make a wonderful show in your garden year after year. There are several kinds of rose bushes and we will give you some tips for making sure they all get the best possible treatment and care when planting them. The very first thing to do is un-wrap your rose bushes. Remove all the wrapping materials, remove them from the box and remove any wrapping around the plants themselves. Leave the rose bush in its pot until you are ready to plant. If you have received a rose tree, check that the stake is secure and put some stones around the pot so that it doesn’t fall over. If you receive your plants in winter – which is a great planting season as long as the ground is not frozen – then of course they will have no leaves on them. That is normal – as soon as spring comes your rose bushes will send out fresh, new leaves and begin to grow. Your plants have been on a journey and they will be a little stressed, so place them in a shady part of your garden and give them a good watering. Do not put them in the garage, a shed or in the house, even if it is cold outside. Your rose bush will live happily in its pot for some time as long as you care for it. After a couple of days you’re your plants into a bright, sunny location. Remember to water every day or every second day, depending on how warm the weather is – do not let the pot become dry. If it does become very dry, place it in a bucket and half-fill the bucket with water so that the soil can soak completely. Roses like sunshine, so choose a bright, sunny spot with at least five hours of sunshine, and ideally more, each day. Roses do well in heavy soils that contain clay, but they don’t like to be in wet soil, so don’t plant them in a low-lying spot where it is always wet. Allow enough room for the spread of your rose and if planting in a group space the plants at about 75-80% of the spread. So if your bush has a spread of four feet, space your plants three feet apart. That way you will soon have a continuous group of plants, without gaps between them. If you are planting your rose bushes along the property line, set them back three feet since your neighbor can cut them if they spread into his property. Good soil preparation is the key to the success of your rose bush. Roses do best in soil that is rich in organic materia and is well-drained; but that does not become completely dry. They prefer heavier soils, even clay, and if you have a sandy soil be sure to add plenty of organic material to the soil. Whatever your soil is like, use it. Do not try to dig a hole and fill it with soil you bought somewhere else. If your soil is poor, just use extra organic material. You goal is to make a large area of looser soil that the young roots can penetrate easily, getting food as they go and establishing quickly. You need to have an area at least three times the diameter of the pot, dug as deep as your spade will go. 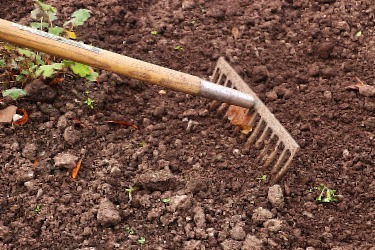 Add plenty of organic material to the soil as you dig. Almost any kind of organic material is good, among the best are well-rotted cow, sheep, or horse manure (if you can obtain them); garden compost; any ‘top-soil’ from a garden center; or if you have nothing else, peat-moss. A bucket of material, or even two, per plant is about right. In addition, plants need fertilizer to help develop their roots. This can be rock phosphate or bone-meal or any kind of superphosphate. 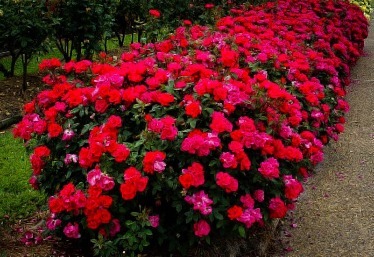 There are many ‘rose bush planting’ fertilizers available too and they all work well, so whatever is available will be fine. Turn over the soil, mixing the organic material and fertilizer into it and then level it off and get ready to plant. Save some of the organic material you used to mulch your rose bush after planting. The evening before you are going to plant, give the pot a good soaking with water. If the root ball is dry when you plant, it may stay that way and cause your rose bush to suffer from dryness even if the surrounding soil is damp. Now dig a hole in the exact spot where you want your rose bush to be, making it twice the diameter of the pot, but only just as deep. If you have dug the soil deeper than that, use your foot to press down the soil in the bottom of the hole, to form a firm base beneath the plant. This is to prevent it from sinking deeper than you want in the hole after you have planted it. Take your rose bush to the planting hole and slide the pot gently off. You may need to tap the edge a couple of times to release the roots, but it should slide out pretty easily. Usually there will be plenty of roots filling the pot and the root-ball will stay together and not fall apart at all. If it looks like the soil is going to fall off the roots, don’t worry, that is easily dealt with. If your plant has no leaves, then just let any extra soil fall into the planting hole. If your rose bush is growing, with green leaves, then leave it in the pot, take a sharp knife and cut around the bottom of the pot and remove the base. Then get someone to hold the pot together while you cut down the side of the pot. Tie a piece of string around it to hold together while you plant. Once you have properly prepared your roses, place the plant in the center of your hole, checking that the top of the root-ball is level with the soil around it. Replace about three-quarters of the soil in the hole, pressing it down around the roots of your rose bush. If you have left the pot on, do the same thing, but when you have finished, cut the string holding the pot together and gently work the cut pot out of the soil. Finish firming down the soil – a gentle foot pressure or firm hand pressure is about right. Regular Rose bushes do not of course need staking, but Rose Trees need to have a strong stake permanently attached to them. The stake that came with your rose may not be strong enough to support all the new growth that is going to come, so replace it with a sturdy wooden or metal stake that goes a little ways into the crown of the tree. Tie the stem to the stake in at least three places, plus one from a strong branch in the crown. As the stem grows and becomes thicker you may need to loosen the ties a little. This is important to allow for maximum growth of your tree. Roses are great plants for pots and containers, since their root-system is not large and they will live well for many years in a large pot. Make sure the container you choose has drainage holes – this is vital and if you can, don’t place a saucer underneath the pot as this can keep the soil too wet. Use a soil for outdoor planters from your local garden center. Make sure your container is large enough for there to be soil beneath and around the root-ball. Water the container thoroughly after planting and then whenever it starts to become a little dry on the top layer. 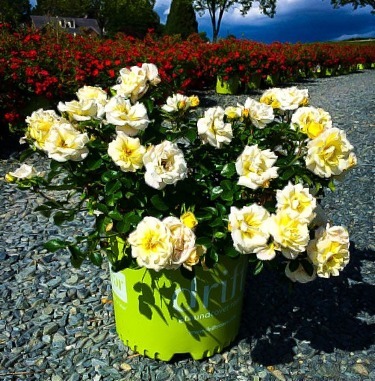 Roses in containers need regular feeding with a liquid plant food designed for rose bushes. Leave your rose bush outdoors in the winter; it needs a period of cold weather. If you live in the coldest zone recommended for your rose bush it is a good idea to bury the pot in a corner of your garden for the winter to protect the roots from becoming too cold. Replace the mulch over the roots each spring and use a rose fertilizer as well. In early spring, as the new shoots are just appearing, trim away any weak, thin branches and dead branches to encourage strong new shoots and lots of flowers. Cut off flowers as they die just above the first full-sized leaf to encourage new flowering growth. So that is it. 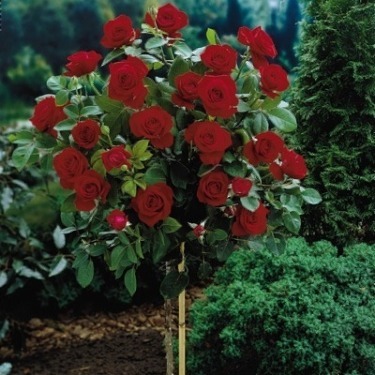 Your new Rose bush is set for a great life and will reward you with greater and greater beauty every year as it develops into a perfect specimen. A little care really pays off.